COOKEVILLE – An investigation by Special Agents with the Tennessee Bureau of Investigation has resulted in the indictment and arrest of a Roane County man, who is charged with sending threatening letters to officials. At the request of 9th District Attorney General Russell Johnson, on January 11th, TBI Agents joined investigators with the 9th District DA’s office in investigating the origin of threatening letters that had been sent to an Assistant District Attorney and a Child Support Judge. During the course of the investigation, Agents developed information that identified Brian Gann as the individual who sent the letters. On February 20th, the Roane County Grand Jury returned indictments charging Brian David Gann (04/04/1987) with one count of Harassment, one count of Retaliation for Past Action/ Intimidation, and one count of Aggravated Stalking. 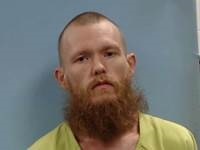 On Sunday, Gann was served by Roane County deputies and booked into the Roane County Jail on a $32,142 bond.